To view a photo gallery of this incredible flight, click here. All of us have grown up watching sports on TV, and as far back as we can remember, they would always show a ground shot looking up at the "Goodyear Blimp" as Al Michaels or Howard Cosell would say "...and aerial photography provided today by the Goodyear Tire and Rubber Company." Sometimes they would add that the "blimp" we were seeing was the Spirit of America or Spirit of Innovation, two of Goodyear's blimp/non-rigid airship fleet. Their ships are iconic, and are woven into the fabric of America. 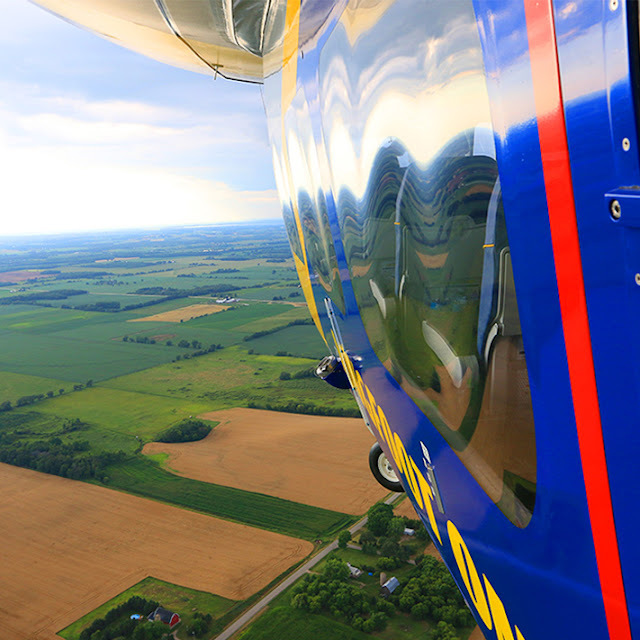 Yesterday at EAA AirVenture Oshkosh, I was lucky enough to be given a media ride in Goodyear's brand new semi-rigid airship "Wingfoot One," which had only a few hundred hours on the Hobbs. Sleek and beautiful, it still has that new airship smell. And while I might call Wingfoot One an "airship" here, and you might say "there goes the blimp," in fact we are both sort of correct. Goodyear's PR team will not correct media who calls it a blimp even though it is technically a Zeppelin NT Model 101, and James Kosmos, a Senior Pilot with Goodyear, says the terms are basically interchangeable. Before climbing aboard Wingfoot One, Airplanista sat down with Kosmos to learn more about what he calls "the most high tech airship on the planet." And the differences between Wingfoot One and the older blimp fleet are night and day. "The old blimps were non-rigid," Kosmos said, "meaning they were a big bag of helium. Wingfoot one has a framework inside making it a semi-rigid dirigible. It is 246' long and holds 300,000 cubic feet of 99% pure helium. It has three Lycoming IO-360 engines, one on each side and one in the tail, with the front engines being able to vector from 0 to 120 degrees allowing us to take off and land vertically or even takeoff backwards depending on obstacles." Wingfoot One's two rear propellers can use different pitches to achieve different results needed to fly what seems like a giant envelope of helium waiting to float away if you let it. "The rear propellers can be vectored to act as sort of horizontal and vertical stabilizers, which gives us the control we need to maneuver the airship in no wind conditions," Kosmos said. "The ship is all fly-by-wire, with one computer for each engine. We move the pilot side stick up, down, right or left, and the computers convert that input into different propeller pitch and vector information, depending on what mode we are in. 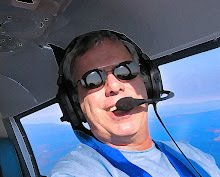 Flying characteristics are like nothing a fixed wing pilot has experienced, because you are basically flying a sail. Each side has more surface area than all the sails combined on one of the old Tall Ships." "This is the only aircraft I have flown that can get heavier as it flies," he said. "The helium expands and contracts depending on the angle of the sun on the envelope and the difference between the temperature of the helium and the OAT. A cloud can move over and our weight changes, sometimes dramatically...the ship's weight is changing constantly. It can make calculating weights much more challenging. And there are other factors too, like when the ship has been sitting outside in the rain. We have to eyeball the envelope and try to figure out how much water is resting on the top, because that's weight, but when we begin to move forward, that water instantly slides off and in a second, we can be 600 pounds lighter." Even though Wingfoot One has the latest in glass cockpit technology, it does not have an autopilot. Because you cannot turn off the lifting characteristics of helium, it is flying 24/7...all day every day. Even when attached to its massive Mast Truck, it is flying. And so when the pilots are assigned a football game, it is all hand-flown. That's because when the airship is configured for TV with a forward camera rack and removable computer system inside, each game is flown differently depending on winds and the whims of the broadcast director. Goodyear's first-class, highly-trained pilot crew does what it takes to get the Director the shot, sometimes doing endless laps around a venue, other times hovering at zero knots for hours. After a short van ride to the airship, I watched it arrive, but the Crew Chief on the radio with the pilot had some bad news. There was a problem with the aft hydraulic system, and with the slashing hand across the throat sign, the Chief told the crew to shut down and "put it on the mast." This is never a good sign when waiting for the flight of a lifetime. 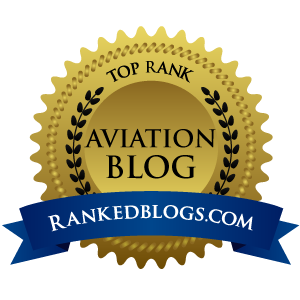 After all of Goodyear's 15 ground support team hovered around Wingfoot One for an hour, it was determined - after reading through the many thick service manuals aboard - that all was well. They could see that the fluid levels were fine by using binoculars to look up high on the tail and view indicators. It's like everything with airship maintenance...you do not just slide up a ladder and look around. Wingfoot One is ALWAYS blowing around here and there, especially when masted, it is just a big wind sock. So everything is done with technicians fast on their feet, moving with the ship to connect ground equipment or put on and remove ballast to correct for the constantly changing weights. So, the flight went from NO GO to GO many times, until it was time to board. That itself is rather interesting. Wingfoot One's beautiful new gondola has 10 passenger seats, and the environment closely resembles that of a rather sparse but comfortable regional jet. When one flight lands, two passengers are removed, and two new people are put on. They do this until the new load of humans are aboard, all to maintain a constant weight...there's that word again. Nothing about "flying" an airship is what you'd expect as a passenger familiar with fixed wing flight. Cruising westbound away from KOSH at 32 knots ground speed, the feeling is more like a boat than an airplane. This is a BIG craft, and it feels like it wants to do what it pleases. While the ride is indeed smooth and peaceful, the movements are, well, just weird. One minute you are heading on a straight 270 heading, and then you look down at the farms sliding underneath and we are sort of crabbing somewhere. Maybe it's left, no, now it's to the right. With a trajectory that feels like the pilot is in constant negotiations with the ship as to direction of travel, Wingfoot One just floats along, a little up, now a little down, I want to go here, no, now I want to go there. But the extreme talent of the Goodyear pilots - all young, handsome, courteous and with perfectly-pressed uniforms - is evident. The pilot always wins the negotiations, and they are always in full control. Even when the pilot turns to talk to inquiring reporters, their left hand can be seen moving the side stick, which needs to be moved constantly so it seems. Our flight was supposed to be maybe 30 minutes, but when Oshkosh's afternoon airshow ran long, the F-22 Raptor flight demonstration was delayed, and we were held by the Airboss six miles west of the airport for an hour! So around and around in circles we went as dairy farms came and went under us. It was surreal, as the view from the gondola is straight down. We also were flying in magic hour light sneaking through a scattered overcast, and the ride was just magical. When we returned to the show grounds, the pilot came in on a left base over the EAA Museum, turned base and final over Pioneer Airport, and coaxed Wingfoot One to again return to the ground pointed straight into a fairly stiff wind. I was really impressed with everyone on the Goodyear team, it is a respected group that does remarkable work. Think of the pilots as sort of the Blue Angels of airship flying, they just do not get any better than this.